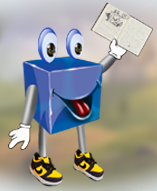 CubertsCube is a excellent site for creative writing for kids aged 7-12 yrs old. This is all done online in a user friendly environment where kids can write/draw a rough draft, get feedback, revise, and then publish and share a finished product. It is FREE until July 31st = )here!! !